It has started we are once again having to actually add new machines. The last four months rather than adding new machines to deal with growing number of users we decided to do a mass hardware refresh. We went from four CPU systems with 4GB ram and slow 250GB 7.2K RPM SATA drives to eight CPU systems with 12GB ram and fast 300GB 15K RPM SAS drives. When we were doing this it obviously added capacity making it unnecessary to continue to add machines to deal with the growing number of users. Well that time has ended as Seattle needed a second machine to deal with the growing demand there. It’s the first of many of new machines at our new specifications. For everyone asking when are new machines coming well the answer is now with the one in Seattle now being up. That’s only one machine obviously but with growing demand in every location and seemingly every month breaking our previous months sales record it’s really only a matter of time. So do not be surprised to see new Dallas and Washington DC machines as well but not yet. We’re all about spending money properly and acquiring machines for the sake of acquiring them is reckless spending. We try to be as smart spending as possible so we’re not buying machines when we have room. There is no point in paying for a bunch of machines that are losing money for the sake of saying yes we have x amount of machines. Instead we rather keep that money that would have been spent on that useless machine and invest it where it can actually be used. There are various ways funds can be used that either help us grow or just enhance our services. For example we could spend that money advertising our services more around the internet. It does not directly affect our users but the more customers we have the better deals we get for things we have to buy such as licenses. So other ways to spend it though are things like having new software on our servers. So possibly new plugins to cPanel or outside software that is used internally to help manage servers or just the company in general. Finally another obvious one is staff that money could instead be used to beef up our staff so having more people available all the time to deal with support. Anyways just to spice this post up a bit more I’ll talk about some differences in the Phantom server. First of all it’s running cPanel 11.25 as we have no choice since it’s now the official RELEASE version although on current machines we’re still holding off due to bugs people are encountering. We do not anticipate these bugs cause any serious issues on a brand new machine. The other interesting change is it’s our first machine running MySQL 5.1 which eventually all our servers will probably be running. As for when we’re not quite sure as of yet sorry. 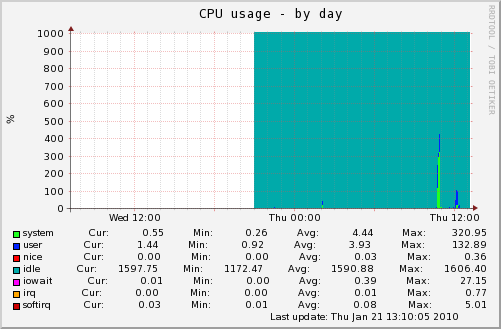 You can see where I ran unix bench on it again to see what it would score. It scored very well that’s all I’ve got to say about that. It’s the same as the CPU usage case you can see the unix bench run as well as looks like the initial R1Soft seed. 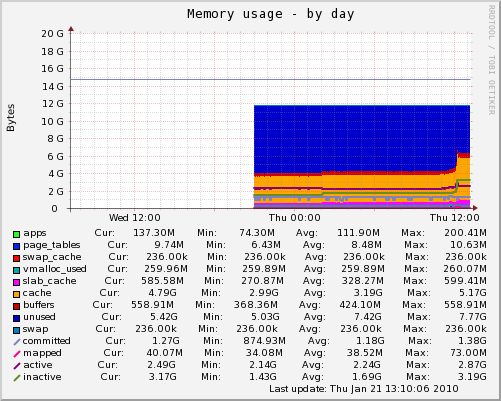 Not a whole lot to talk about here we’re using nearly no memory since no one is hosted on it yet. I’m sure that’ll go up to the 6gb used when it’s full. That’s about all I have to talk about right now hopefully will have some exciting new features to talk about next time.